UCOG Today [Paul Kieffer] » Blog Archive » "Boy, is she ugly!" A skinny dog showed up one day last summer in Mobile ("zugelaufen"). She looked quite thin with her ribs showing, and she hid under the car in the carport anytime anyone got near her. 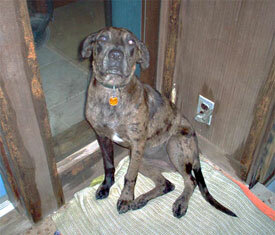 She was a puppy, a "Louisiana Catahoula Leopard Dog" (I had never heard of the breed, either!). Monica coaxed her out from under the car with some food, and she has been here at the house in Mobile for about six months now. What should her name be? I suggested "Sue" based on an old country song by Johnny Cash (except she is not a boy). I first saw Sue in June, and when I got out of the car after arriving from the airport I thought she was kind of ugly. Sue didn’t tell me what she thought of my looks, but she barked a lot. As things go with pets, she kind of grows on you. And she grows, too, having gained weight since May. This type of dog needs vigorous exercise, and I guess someone had her in an apartment or other fairly confined space and couldn’t handle her energy, so they probably let her out down here where we live. Other than doing "dog things" like digging holes all over the yard and rummaging through the neighbor’s trash, Sue has been a pleasant addition to life here in Mobile.